CCF seeks to work with the site and to respect ecological processes and inherent variation rather than impose artificial uniformity. In practice this leads to a presumption towards the use of natural regeneration and the development of mixed species and mixed aged stands. CCF regards the forest ecosystem as the production capital of the forest. This includes the soil, the forest micro climate, associated fungi, flora and fauna as well as the trees themselves. Management for timber production is directed towards the creation, maintenance and enhancement of a functioning ecosystem rather than the periodic creation and removal of individual crops of trees. CCF regards the maintenance of forest conditions as an essential tool in achieving its aims. The use of overstorey to influence the amount of light reaching the forest floor, to limit ground vegetation, trigger regeneration and then control its development is crucial. If clearfelling takes place, forest conditions are lost, the benefits of shelter reduced and regeneration becomes more difficult. Under CCF management, stand improvement is concentrated on the development of preferred individuals rather than the creation of a block of stems with uniform spacing and average stem characteristics. The handling of individuals or groups of stems takes place within the context of the whole growing stock of the stand, the size and composition of which is manipulated to achieve the desired rate of regeneration and to produce the required range of timber products. A characteristic of permanently irregular stands is that yield control is based on measurements of stem diameter and increment rather than area and age. The CCFG feels that British forests managed in accordance with the principles described above, will generally develop a permanently irregular structure at the compartment level over a long period. At this time, however, it is uncertain whether permanently irregular structures will develop in stands composed entirely of light-demanding species or in certain upland forests types. In such cases, higher rates of natural disturbance will lead to a mosaic of structures, some of which may involve regeneration gaps of a significant size. The transformation process, i.e. 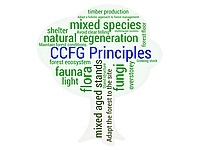 the initial period when CCF principles are applied to even-aged stands, may also involve even-aged elements, either through the use of small-scale clear felling or the adoption of shelterwood systems.